AMMONNEWS - Israel’s military said on Tuesday it had begun an operation to “expose and thwart” cross-border attack tunnels from Lebanon dug by the Iran-backed Lebanese militant group Hezbollah. 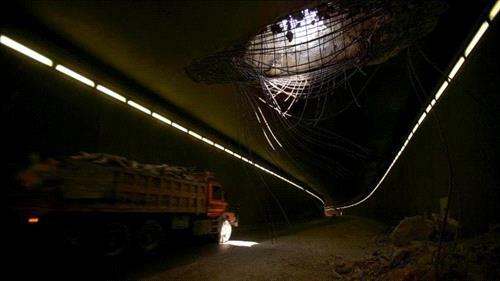 Israeli military spokesman Lt. Col. Jonathan Conricus said the military had detected tunnels crossing from Lebanon into northern Israel. He said the Israeli operation to counter the tunnels would be inside Israel, and would not cross the border. Israel released video footage of digging and pile-driving equipment at work in unidentified locations, carrying out what it said were “tactical preparations to expose Hezbollah’s offensive cross-border tunnel project”. Reuters could not immediately verify the footage. The situation appeared calm on the Lebanese side of the border where UN peacekeepers and Lebanese troops were deployed as usual, a Reuters journalist there said. There was no immediate comment from Hezbollah. Israel and Hezbollah have avoided any major conflict across the Lebanese-Israeli border since their last war in 2006, though Israel has mounted attacks in Syria targeting what it said were advanced weapon deliveries to the Shiite group. On Monday, Netanyahu met US Secretary of State Mike Pompeo in Brussels. An Israeli government source said the meeting was to update Pompeo of the upcoming tunnel operation. The current focus of operations was near the Israeli border town Metulla, Conricus said, adding that some areas near the border fence had been closed off. An Israeli military source said the operation might take weeks to complete. The United Nations Interim Force in Lebanon (UNIFIL) said the situation in its area of operation “remains calm” and it is coordinating with relevant parties to maintain this stability. It said the army had “enhanced its presence and readiness” and was prepared for “various scenarios”. In September, Israeli Prime Minister Benjamin Netanyahu identified three locations in Lebanon where, he said, Hezbollah was converting “inaccurate projectiles” into precision-guided missiles. He said an upcoming security challenge would require Israelis to “endure sacrifice”. Israel’s vulnerability to tunnels was laid bare during its war with Palestinian militant group Hamas in Gaza in 2014 when Palestinian militants used dozens of secret passages dug from Gaza into Israel to launch surprise attacks.